In this week's webinar, Larry Jordan shows how to export the audio files for a dramatic scene from FCP X using XML, convert the XML file using XtoCC, edit and mix the audio in Adobe Audition, then bring the final mix back into FCP X for final output. DOWNLOAD NOTE: After you complete the store checkout process, you will see a Download Link on the Order Confirmation page. This link allows you to download the product to your computer. You are given four attempts over ten days to download the file. Since this title is downloaded, a CD/DVD will not be shipped to you. 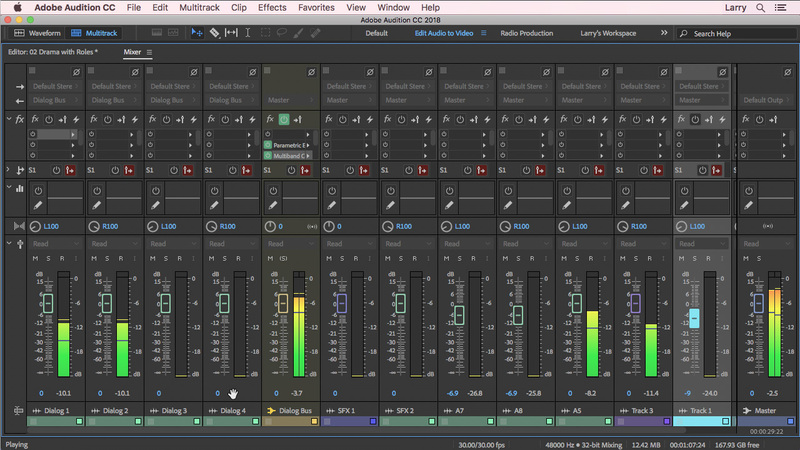 This week we take a look at audio mixing for FCP X projects. The short answer is that, while FCP X excels at audio editing, it isn’t that great for audio mixing. Watch as Larry Jordan shows how to export the audio files for a dramatic scene from FCP X using XML, convert the XML file using XtoCC, edit and mix the audio in Adobe Audition, then bring the final mix back into FCP X for output. NOTE: This session focuses on workflow, not the actual audio mix. It sounds like a lot of steps, but the results are worth it. Larry uses this workflow every week to create the finished audio for all his weekly webinars. This advanced session assumes some knowledge of Final Cut Pro X and Adobe Audition CC. This session is delivered as a QuickTime movie, you don’t need to have any other software installed to watch it. To simplify navigation and help you quickly find information when you need it, we include chapter markers in the QuickTime download. Click here to learn how to display these in your download.